A broadcaster, writer and producer for over 25 years, Paul Romanuk has extensive international experience, from his well-known work in Canada and the United States to his continued success across Europe and Asia. He spent 18 years with Canadian broadcaster The Sports Network and career highlights include covering 11 World Junior Hockey Championships, eight World Hockey Championships, four Olympic Games and the World Cup of Soccer. 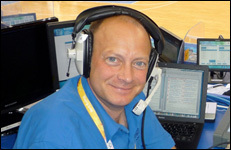 His production credits range from co-executive producer of Canada’s Spengler Cup coverage since 2001 to executive producer of The Champions Hockey League during the 2008-09 season. As a freelance writer, Romanuk has had nearly 30 titles published by Scholastic Publishing. Hockey Superstars has been published annually since 1985 and is one of the best-selling titles for young readers across Canada. He has also written feature stories and columns for a wide range of publications including The Toronto Star, The Globe and Mail, The Toronto Sun, The Hockey News, Swiss Sonntagsblick, Sports Business International, Sport Business Daily and Sportsnet.ca.